← Biologos – infinitesimal change or stasis? The second half of the Attenborough series on vertebrates, which I watched last night, kept the teleology coming. I guess it’s pretty plausible to say that because marsupial young are at risk of predation and infection, mammals needed to develop a placenta so they could be born well-developed. However, to be strictly ateleological one ought to say that those mammals that happened to develop a specialised uterus equipped for gas and nutrient exchange and massive growth capacity, and a modified lower genital tract, muscular and skeletal structure to allow live birth of large offspring, together of course with greatly enlarged lactation gear and radically altered habits of nurture; at the same time that their embryos grew an entirely new organ also capable of umbilical gas and nutrient exchange, and the bizarre habit of implanting parasitically into the new maternal uterus, whilst both parties neatly solved the problem of rejection but allowed the transfer of passive immunity… those mammals had some selection advantage over marsupials. That would make for a clunky storyline, though. The most interesting thing to me in the programme, though, was a brief aside about colour vision. Colour vision’s always fascinated me, perhaps because of a childhood interest in photography, and the realisation that “primary colours” in photography and art are a biological, not a physical, phenomenon. Somehow we covered primary colours in physics at school without once mentioning that fact. The dark blue peak corresponds to the “rods”, which we can ignore for now as they are concerned mainly with night vision. You can see that light of all different frequencies will produce unique combined responses, which our brains can interpret as the whole spectrum of colours. I particularly like the way that little peak in the red on the left explains why purple and violet look so similar, though they’re at opposite ends of the spectrum: the red receptors are involved in both cases. Returning to the subject, David Attenborough mentioned, almost in passing, that amphibians and reptiles always had three-colour vision, but that early mammals lost it at the time they were small, nocturnal beasts. Only primates (who needed colour vison to see the fruit that evolved to be seen by tri-chromic insects, though of course one mustn’t speak teleologically…) regained it. 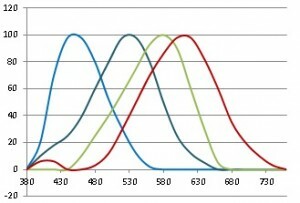 As you see, there’s a very similar pattern to the human one, with an extra, grey, peak stretching into the ultra-violet at the left. So all the critters can see UV (and incidentally humans could a little, too, using their rods, if the lens and cornea didn’t filter it out). The early mammals seem to have lost the UV and red cones, apparently because their absence assisted low-light vision. The primates alone regained the red (or a similar pigment at a slightly higher frequency), but not the UV. Non-primates don’t then have true monochromic vision, but are red-green colour-blind like a good number of humans (and many more new-world monkeys, which suggests it’s not that big a deal for survival). 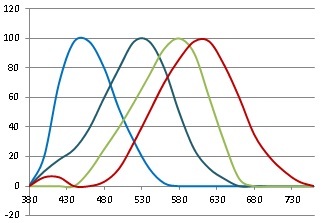 Your dog only has two sets of cones, so is dichromic.The difference that makes is not so much the confusing of two colours (red and green), but a lessened distinction between all colours: if you’re bichromic you can distinguish around 10 thousand colours. Add the third cone and you can see 10 million. 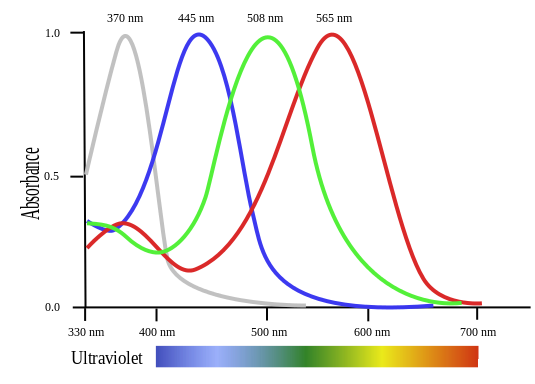 A little thought will show that the fourth pigment of the “lower” vertebrates doesn’t just enable one to see further into the blue end of the spectrum, but probably increases colour distictions exponentially at that end of the whole visual spectrum. The Darwinian story told for the regaining of red by primates is the usual catch-all of gene duplication and divergence, which in this case hangs together pretty well. In fact the whole colour vision story makes good sense within classical evolutionary theory – all historical happenstance and making-do. It would probably be one of my test-cases were I teaching biology. Yet there are some loose ends that rather spoil the neat just-so story. The first is the near-universality of tetrachromic vision across both invertebrates and vertebrates. That would suggest it’s highly selectable – that is, pretty damned important. During the whole Mesozoic, when reptiles were becoming warm-blooded as dinosaurs, pterosaurs and birds, or even just so large that nocturnal heat-conservation was no problem, they all retained it. Even snakes, which are said to have evolved as underground creatures. Surely some were nocturnal? Yet the mammals couldn’t jettison their cones quickly enough. Then there’s the question of re-acqusition, or convergence. look at the bird graphic again – pigments with 4 peaks, evenly spaced to cover the whole visible spectrum, evolved very early – even crustaceans see colour (with twelve pigments! ), so maybe the iconic Cambrian Explosion was to blame. And it occurred repeatedly, at the least in arthropods and vertebrates. Yet although mammals have dominated nearly every ecological niche since the Cretaceous extinction, only the primates have re-trod this evolutionary pathway – and that using a pigment quite close to the green receptor in response. Aquatic mammals have even lost another one, making them monochromatic. Where did the selection-pressure go? Why did what had been de rigeur in the Palaeozoic prove near-impossible in the Cenozoic, even in competition with giant birds of the Eocene, whilst running out the beta-version placenta was unproblematic? And do you colourblind people get indigestion from eating unripe fruit all the time? May be off-topic, Peter, but it’s plumb interesting. Like the fact that octopi only have monochrome vision but can match their colour perfectly to surroundings. Thanks – that seems to explain Peter’s report. It would be interesting (but idle curiosity on my part) to know how far down the evolutionary tree that system exists. I bet platypi don’t get migraine. Just looking in general sources like WikiPedia whilst doing the OP I’m amazed just how many systems are built around eyes: rods being sensitive to UV, some women (apparently) being tetrachromic, octopi having monochromatic eyes but able to clock polarisation… and all that’s before the rather sophisticated pre-cortical processing that detects motion, lines, boundaries and so on. Here’s a review that I found later. It says melanopsin is more similar to invertebrate “rhabdomeric” photopigments than to the other vertebrate opsins. With a little more rummaging I found part of an answer to your idle question. There are 2 paralogs of melanopsin, OP4m and OP4x. The mammals that have been looked at have only OP4m. All the other vertebrates examined have both. Where it has been looked at, the non-mammal vertebrates express melanopsins in more tissues than mammals, which only express the one kind in ~2% of retinal ganglion cells. The other vertebrates express melanopsins in brain and skin melanophores. Sorry for slow reply – grandfather duty this weekend (and a significant local gig tonight). Interesting paper and subject. Thanks. It would seem logical that pigments to regulate circadian rhythms and so on would develop early, even in animals not needing decent vision, so expression in the skin makes sense. I venture the hunch that invertebrate versions serve the same kind of purposes. 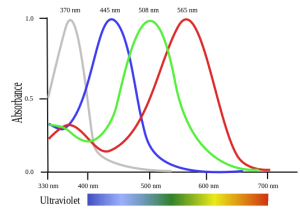 Less clear is why, since the same nocturnal lifestyle that (according to Attenborough, at least) led to loss of cone-types would also make circadian rhythms, light avoidance etc (as in the mice) especially important, mammals would lose one of the pigments, and why it should become restricted to the eye. Interesting to condiser, though, that light sensitivity likely preceded eyes, but that when they arose in vertebrates, they seemed to develop an entirely new pigment system rather than just building an eye round the old one (as in the Dawkins just-so story). But it’s less interesting as an evolutionary issue than just being reminded of another little-known but vital system that makes life possible. Thanks again for doing the work to indulge my whim!